Product #60610 | SKU MON-CINE7-GM-KIT | 0.0 (no ratings yet) Thanks for your rating! A deposit of $260.00 is required for this pre-order. SmallHD Cine 7 On-Camera Monitor with ARRI Camera Control (Gold Mount) is a top of the line professional 7" monitor with ARRI camera control. Its 1800 nit, daylight viewable display and 100% DCI-P3 coverage make this monitor an absolute joy to work with, in any production environment. With Teradek RT overlay integration and Teradek wireless video technology, Cine 7 delivers an experience that represents the gold standard for A-list cinematography. The Cine 7 offers the durability and ﬂexibility required by demanding professionals. 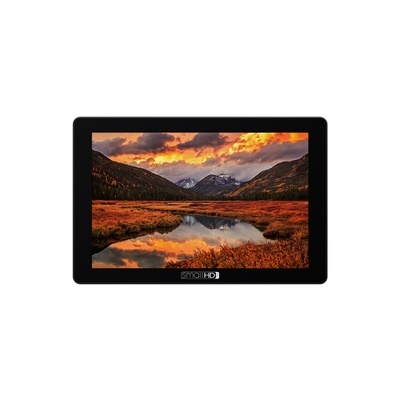 With a lightweight milled aluminium frame and several 1/4"-20 mounting points, the 7inch monitor is ready to perform on any rig and in any environment. Cine 7 includes several 3G-SDI and HDMI inputs and outputs, as well as signal cross conversion. Power options include a locking 2-pin connector and interchangeable battery brackets (Gold, V, and Sony L series). An Ethernet port allows for camera control connectivity.